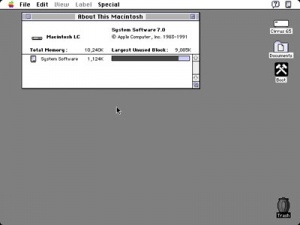 Major upgrade to the Apple Computer system software from the earlier System 6. If you're running System 7 on a slow machine (a Plus, SE, or Classic), there's a way you _might_ be able to get things to run just a bit faster. Many System file and Finder resources are stored in compressed form to save disk space, but of course the tradeoff is that it takes time to decompress them before they can be used. With ResEdit, carefully copy all the resources in the System file or the Finder and paste the resources back in on top of themselves (use the same ID's), and save your work; this effectively decompresses all the resources for good (because ResEdit can't save compressed resources). DO THIS AT YOUR OWN RISK -- you'll certainly want to have clean copies of your System and Finder around for a while after you do this, just in case. This page was last modified on 21 April 2019, at 17:19.